There's been a lot of talk on the forum as we approach free agency and the draft regarding positional value. So in order to try and objectify this, I think it may be helpful to show a preliminary study that I conducted last off-season. With it being last off-season, and the cap changing, the numbers will not be 100% perfect, and I fully acknowledge that as a current limitation of the study. Below I will outline the methods used, any choices I had to make regarding who would be eligible, and any other information that would be important to know to understand how the study was conducted. After that, I will list the results and then provide what I think the implications of this are. The draft is often considered in its value for acquiring good players. This is true. You can also acquire good players through free agency as well. The value in the draft is that you are able to acquire good players (at least, in theory) for rates that are well below what they would receive in free agency. The second assumption is something I believe on a macro-scale but not necessarily a micro-scale. Particular contracts can be bad for either team or player, but with a large enough sample size, I think we can see at least a semi-efficient market form. NFL teams have a long way to go in terms of efficiency, but I think this is as good of guideline as any for conducting a study such as this. I fully acknowledge the limits of using player contracts as a proxy for positional value given NFL teams' efficiency struggles in other areas. 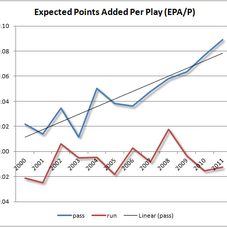 For this study, I utilized spotrac's data for player contracts. I used only players that had received an extension beyond their rookie season or received a contract in free agency. Rookie deals were not included in this because no market forces were prevalent in those contracts. When deciding which players to use, for positions where there is one traditional starter, I used the top-20 players at that position that fit the above criteria. For positions where there are two traditional starters, I used top-40 players at that position. There are obvious limitations to this method, especially at positions like CB and WR which more or less start 3 players at those positions, but when looking at contact data, I was concerned this would de-value those positions too highly. Again, there are clear limitations to this data, but I wanted to use this as a guideline. I put all of the contracts into a spreadsheet and then put together an average for those 20/40 contracts. This is what I consider to be "average starting money" at a position. Then, to try and get an idea of what elite/high-end talent gets paid at a particular position, I conducted a 5/10 split for "elite" contracts. QBs are unsurprisingly, the most important position on the team. The next tier of players appears to be LT, EDGE, WR, and IDL. The following tier looks like CB, FS, and TE. RB, SS, and ILB appear to be the least important positions. One piece of information that is important to note is that while IOL (OG, C) are not highly compensated by averages, elite IOL are still highly valued. Another thing I find noteworthy is that "elite" TEs are not much more highly compensated than your average TE. I think that may be due to the fact that there are far fewer elite TEs than elite players at other positions. Obviously the data itself doesn't tell us everything, and there is some subjectivity to tiering this data. It depends on how much you value averages vs high-end talent, and also how efficient you think NFL teams are being overall. 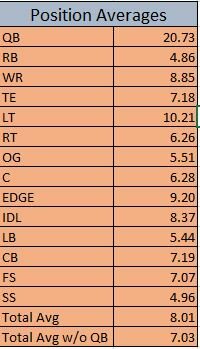 When it came to tiering things in for me, I also considered the fact that teams overvalue running the football, which is why SS, LB, and RB ended up in the bottom tier even with contract numbers not being too dissimilar in some cases from the tier above. Hopefully this information will help with discussions on the forum this off-season! Hope you enjoyed! I'd like to hear some feedback on this as well. The only issue I have with this is that receivers are going to get paid more due to generating ticket sales and the entertainer aspect of the position. Otherwise this confirms what I've been saying for a good while. Really no other position except for QB attracts sales and jerseys and such more than WR. It is a star position, and thus, I feel, effects the results. And that only adds to this study. Casual fans can list probably 10 DL in the league, and yet they're among the highest-paid. Casual fans can probably list 30 receivers. I personally think safeties are far too undervalued in the NFL, but not surprised by that. As far as WR/CB, I absolutely see CB as CONSIDERABLY higher value than WR. Receivers know where they're going, corners don't, the advantage in that matchup is on the WR, so I'd rather have a great CB than a great WR any day of the week. QB, EDGE, IDL, OT, CB, S, WR, RB, ILB, IOL is still my ranking. The only downside to it (for me) is that it isn't helping me very much in my current dilemma, whether to take a DL (3tech penetrator) or an edge rusher at #12. Both have high positional value (as dictated by salary) and both can affect the pass rush, which the Packers could certainly use. There are different ways to view the fragment of your piece that interests me. One interesting way to 'tie-break' is to look at who got the snaps at the positions last year, who is likely to be on the roster this coming year and who will replace the holes created. That tends to favour getting edge rushers, where the incumbent talent for 2019 is likely to be weaker than on the DL, but my instinct is that the chance for a great DL is better than a great edge guy (and instincts have no value in calculation based data, it is just my perception based on nothing concrete. Other things also tie into trying to make this choice, like drafting to a strength making a good unit much tougher to stop. As always, in the final analysis, it's about the level of talent and how it is developed, in other words, "draft well and be rewarded". Apologies for a highjacking of your thread for something that connects only peripherally, back to other posters comments. I think the "don't draft for need" thing has kind of gone overboard in a way. The value you are getting as a team is directly related to how much you need someone. Let's say one of Haskins/Murray is there at 12... They probably have the highest value because of positional need (and the fact they appear to be 1st round quality prospects), but to GB they have no value. So need does matter when you're trying to get value, which is why I would push EDGE slightly higher than IDL for GB, but given that Daniels is nearing the end of his contract, it is not THAT big of a difference. I recall a TT comment from years back (and he never gave away much), that suggested he gave a 'small bonus' to a position of need, when calculating players values in the draft. In TT's inimitable way, he is supporting what you say here, ie need does play a part..........which is kind of obvious to my mind, but there are others that are pure BPA enthusiasts. I don't think it's even controversial, it has to. The draft is an avenue to improve your team and drafting someone who won't improve your team as much doesn't make sense. I don't even use BPA anymore, I use BVA (best value available) and even then I'd probably like to use BEVA (best expected-value available) because there is projection involved in all of this and far too often we're way too confident in our assessments. Using something like confidence intervals would probably be helpful to forecasting draft prospects and getting a better understanding of their value. Confidence intervals are hard to determine, but give another important facet to deciding who to draft. The popular current expression of confidence, is high/low ceiling, and high/low floor. Oh it's basically impossible. I don't even know how I would try to properly quantify it. Maybe provide a dollar value for an expected ceiling/floor, but even that relies on proper evaluation being done. It's hard. I'm not sure I agree with the implication you're putting forth here. So jersey sales don't go to the team in particular. 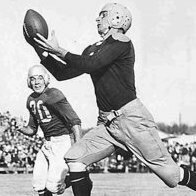 From an excerpt looking at the economics of sports merchandising: "Between 11 percent and 15 percent of the merchandise sales will go to the league and is then shared equally among the teams. The rest goes to the manufacturer." So there's no real reason to think owners would offer more to players because of their jersey sales/marketability. If you want to make more money, win football games. Winning brings dollars. Playoff games bring dollars.